For 2.000 years Bordeaux has been producing an incomparable range of wines. No other region can match the tremendous variety of the wines produced in Bordeaux and only Burgundy can match their greatness. This region, spreading along both banks of the Garonne River in the Southern part of France, produces red wines (the famous “clarets”); rosé wines; dry, medium-dry, sweet and very sweet white wines. The wines of Médoc are red. They are lightbodied and unique in the world for their elegant fragrance, their mellowness and their delicate and long lasting taste. ST. EMILION: the wines of this district are red, full-bodied, robust. They have a strong bouquet and a distinguished taste. POMEROL: a very small district. Its wines are red. a little lighter than the St. Emilions with which they share most of the characteristics in bouquet and taste. GRAVES: Graves produces both red and white wines. The whites may either be dry or medium dry. They are well balanced, elegant wines with a delicate bouquet and a fruity flavour. SAUTERNES: Sauternes, which includes the township of BARSAC. produces the greatest naturally sweet wines in the world. They have a beautiful deep golden colour. They are mellow, very fruity with a long lasting, rich flavour. From Médoc, St. Emilion, Pomerol. Graves, Sauternes and Barsac come the greatest of the wines of Bordeaux. but very excellent wines are also produced in the other districts. Better known are the wines of CERONS, SAINTE-CROIX-DU MONT, LOUPIAC, COTES-DE BORDEAUX-SAINT-MACAIRE, PREMIERES COTES DE BORDEAUX, SAINTE-FOIX. ENTRE-DEUX-MERS, GRAVES de VAYRES, CANON FRONSAC and COTES de CANON-FRONSAC. The red wines of Bordeaux, especially the ones from the Médoc, Graves, Pomerol and St. Emilion, age exceptionally well. Although most of them may be drunk young. generally they may be kept for several years. Some of the greatest red Bordeaux may reach their peak between 10 and 20 years and some have been known to last for 50 years and longer. White wines mature more quickly than reds and the dry white Bordeaux too are drunk when young, although they keep well for several years. The rich wines of Sauternes are slower in reaching their peak and age very well. Médoc is one of the most famous of the French wine-growing regions, consisting of the region in the département of Gironde, on the left bank of the Gironde estuary, north of Bordeaux. The region owes its fame to its production of red wine, home to around 1,500 vineyards including many of the finest in the world. The Médoc’s geography is not ideal, with its proximity to the Atlantic Ocean resulting in a comparatively mild climate and high rainfall making rot a constant problem. It is generally believed that the region’s greatness derives from the soil; although the terrain is flat, the excellent drainage is a necessity and the increased amount of gravel in the soil allows heat to be retained, encouraging ripening, and extensive root systems. With the exception of Château Haut-Brion from Graves, all of the red wines in the famous 1855 Classification are from the Médoc. Almost all of the region’s wine consists mainly of the cabernet sauvignon grape, with merlot forming the majority of the remainder. In addition cabernet franc is usually used in small quantities, with petit verdot and malbec occasionally added. St. Estèphe is a village and commune on the left bank of the Garonne estuary in the Gironde département of south-west France, famed for its production of red wine. The village lies 20 km north-west of Bordeaux. Saint-Estèphe is best known as the northernmost, and one of the four major wine growing appellations of the Médoc, home to many of the world’s most-prized red wines. The area is separated from Château Lafite-Rothschild in Pauillac to the south by the Jalle de Breuil stream and its vineyards cover around 12 km² on the banks of the Garonne. The layers of gravel on top of clay lead to comparatively poor drainage, and the harvest is one of the latest of the whole region, although this water retention can be of use in vintages of low rainfall. The wines are distinctive and age extremely well, though often lack the finesse of the village’s southerly neighbours. Pauillac, is a small village and port on the Gironde estuary, famed for producing some of the finest and longest-lasting red wine in the world. The village boasts a mere 3000 acres (12 km²) of vineyards in the Haut-Médoc between the villages of Saint-Julien to the south and Saint-Estèphe to the north, yet has the unique distinction of being home to three of Bordeaux’s five first growth wines: Château Lafite-Rothschild, Château Latour, and Château Mouton-Rothschild. Margaux is a village and commune in the Gironde département of south-west France, famed for its production of red wine. Population: 1,358. The village lies in the Haut Médoc wine making region on the left bank of the Garonne estuary, north west of the city of Bordeaux. Margaux’ fame rests in the name of the wine appellation, Margaux AOC, that encompasses the village and the neighbouring villages of Arsac, Labarde, Soussans and Cantenac, and is the most southerly of Médoc’s appellations. The commune makes almost entirely red wine. The 1855 classification contained more wines from Margaux than from any other appellation, and its most famous vineyard, Château Margaux, was one of only four wines to be awarded the coveted Premier Cru status. Pomerol is a village and wine growing region (AOC) in France. It is a commune of the Gironde département, located near Bordeaux. Many small growers in this area of about 7.60 km² produce a plummy, generous, long lived wine. Predominant grape variety used is Merlot, often together with Cabernet Franc. is a small town near Bordeaux, France that is famous for the eponymous wine region that surrounds it. The Romans planted vines in what was to become Saint-Émilion as early as the 2nd century AD. In the 4th century, the Latin poet Ausonius lauded the fruit of the bountiful vine. The origins of the town date from the 8th century, when Emilian, a travelling confessor, came to settle in a hermitage carved into the rock.Saint-Émilion is located 35 km north-east of Bordeaux, between Libourne and Castillon-la-Bataille. St Emilion is one of the 4 principal red wine areas of Bordeaux (the others being Médoc, Graves and Pomerol). The same grape varieties tend to be used but in a different ratio, with Merlot and Cabernet Franc predominating, whilst relatively small amounts of Cabernet Sauvignon are used. The region is much smaller than the Médoc and adjoins the wine region of Pomerol. 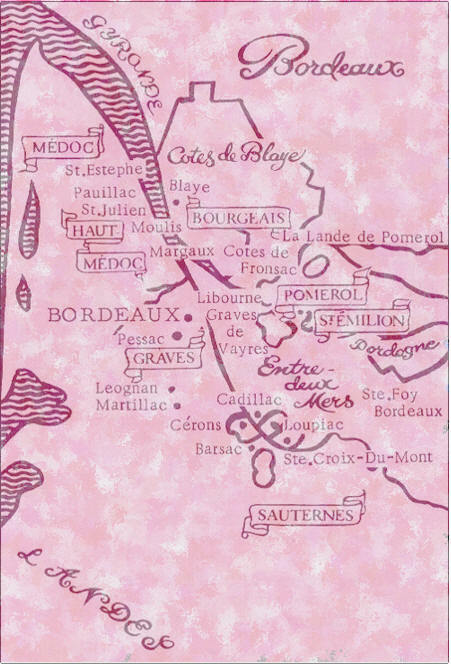 As in Médoc, the winemakers devised a system of ranking the vineyards. Whilst that of Medoc was done in 1855 Bordeaux Wine Official Classification of 1855 that of Saint-Émilion was first done in 1878. The use of the word “first” is significant, as unlike the Médoc classification which has never been revised (except for the promotion of Château Mouton Rothschild from 2nd to 1st Grand Cru Classe), the Saint-Émilion classification is revised about every 10 years. Château Ausone, and Château Cheval Blanc are the only two wines currently classified as Premier grands crus classes A (First Great Growths category A). There are then 11 premier grands crus classés B and 62 grands crus classés. In addition, a number of vineyards are classified as Grand Cru. In 1954 the wines of St-Emilion in the great wine-growing region of Bordeaux were classified. Unlike the Bordeaux Wine Official Classification of 1855, the list is updated every 10 years or so. Following the initial classification, the list was updated in 1969, 1986, and most recently in 1996. The 1996 classification comprises 13 Premier Grand Cru Classé and 62 grands crus classés. meaning ‘gravel land’ in French) is an important wine region of Bordeaux, producing over 20 million bottles each year. The region stretches 50 kilometers south east from the suburbs of Bordeaux itself long the left bank of the Garonne river, and despite being principally a producer of red wine, it is the only of Bordeaux’s regions to be known for both its red and white wines. The area encompasses villages including Pessac, Talence, Léognan, Martillac, St Morillon, and Portets. In 1987 the region was split into a second appellation with the creation of Pessac-Léognan, containing most of its most celebrated Châteaux. This has had the effect of devaluing the name of wines labelled with the Graves appellation, and so are considered by many to be better value than those of Pessac-Léognan. The area’s red wines are generally considered to be more robust than those of Médoc, and are made using a majority of Cabernet Sauvignon, with smaller amounts of Merlot and Cabernet Franc. The famous dry white wines are a blend of Sauvignon Blanc and Sémillon. Despite its importance, the region was largely overlooked by the famous Bordeaux Wine Official Classification of 1855, and only a single producer, Château Haut-Brion, was included, being one of only four wines to be assigned the status of Premier Grand Cru Classé. After the Second World War the omission of the great wines of Graves from the official classification was having a noticeable effect on the price and desirability of wines from the region, and so in 1953 the region announced its own classification of red wines, with white wines being added in 1959. Sixteen wines were given the title Grands Crus Classés, though most now fall in the Pessac-Léognan appellation. Other wines that pass the requirements are labelled Appellation Graves Controlée. In addition, the appellation of Graves Supérieurs Controlée is reserved for the region’s sweet white wines.